Reprinted in full from The Healing Power of Art & Artists. 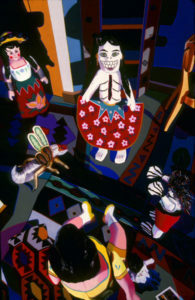 Barbara Rachko is an internationally exhibited American contemporary artist best known for her pastel-on-sandpaper paintings that are inspired by Mexican and Guatemalan cultural objects. 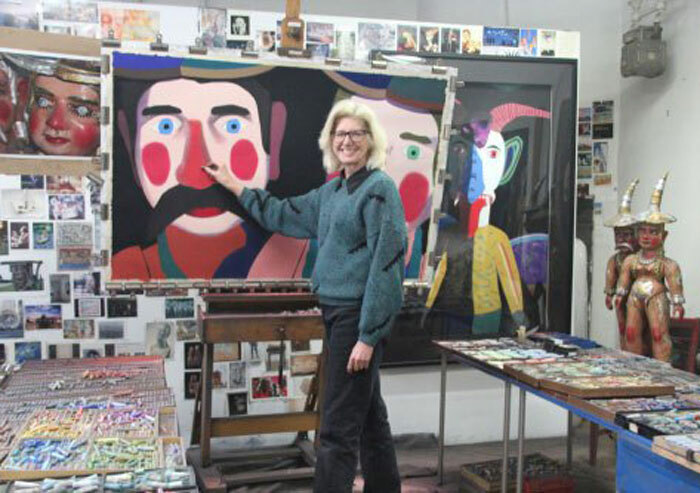 She is also the author of “From Pilot to Painter,” (available on Amazon.com), and maintains a popular art blog “Barbara Rachko’s Colored Dust” which has more than 28,000 subscribers. 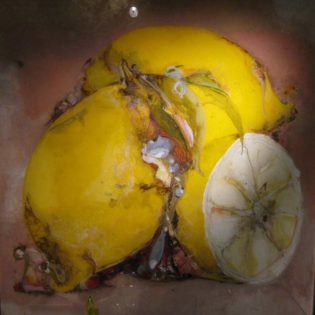 During her more than 30 year career as a professional artist Barbara has won numerous accolades including a Joyce Dutka Arts Foundation award and grants from the Templar Trust. On June 16, 2001, I married Dr. Bryan Jack, my longtime companion and soulmate, during a very private ceremony in the garden of an historic Alexandria, Virginia residence. In attendance were a justice of the peace, me, and Bryan. He and I were 48 years old and this was the first marriage for us both. Sadly, we never celebrated an anniversary. Exactly 87 days later my new husband was the victim of a terrorist attack. It was so unfair. I was numb and in shock. She Embraced It And Grew Stronger, 2003. Soft pastel on sandpaper. 58 x 38 in. Framed 70 x 50 in. The following summer I was ready to — I HAD to — get back to work in my studio. Conundrum, 2017. Soft pastel on sandpaper. 38 x 58 in. Framed 50 x 70 in. dealing with the loss became easier with time. The Champ, 2017. Soft pastel on sandpaper. 26 x 20 in. Framed 35 x 28.5 in. In 2003 I resumed making my Domestic Threats series of pastel paintings, something that had seemed impossible after Bryan’s death. The first large pastel painting that I created using a reference photograph taken by me confirmed that my life’s work could continue. The title of that painting, “She Embraced It and Grew Stronger,” was autobiographical. “She” is me, and “it” meant continuing on without Bryan and living life for both of us. Having had a long successful run, the Domestic Threats series finally ended in early 2007. Around that time I was feeling happier and had come to better terms with losing Bryan. While this is a tragedy I will never truly be at peace with, dealing with the loss became easier with time. I am looking forward to creating many new, striking pastel paintings! Between, 2007. Soft pastel on sandpaper. 20 x 26 in. Framed 28.5 x 35 in. Barbara’s first of the “Black Paintings” series. My next pastel painting series was called, Black Paintings. 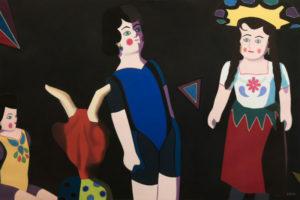 I viewed the black background as literally, the very dark place that I was emerging from, exactly like the figures emerging in these paintings. 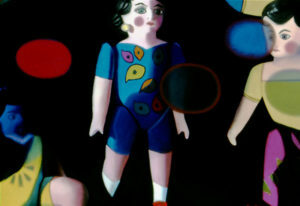 The figures themselves were wildly colorful and full of life, but that black background is always there. Still the work continues to evolve. 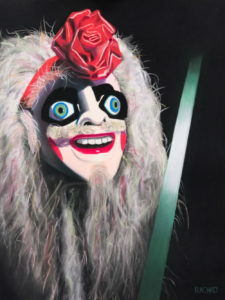 Recently I began my third pastel painting series, Bolivianos, based on a mask exhibition encountered in La Paz at the Museum of Ethnography and Folklore. Many people have proclaimed this to be my most bold, daring, and exciting pastel painting series yet. And I think they may be right! Continuing on the journey I began 30+ years ago, I am looking forward to creating many new, striking pastel paintings! 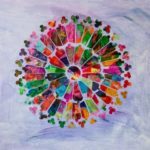 For more of Barbara’s work, visit our online gallery. Thank you for sharing my story. I hope it may give hope to anyone who is going through a rough time.